Hi, everyone! 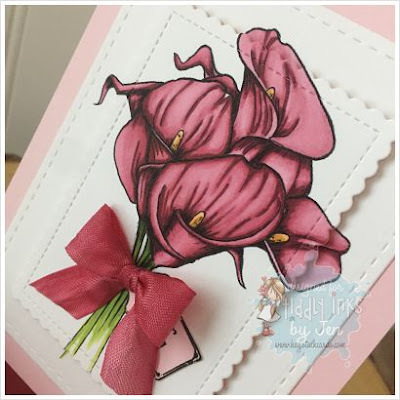 Today is Fabby Friday over on the Tiddly Inks Challenge Blog and my card features a newer digital stamp called Grandma's Lilies. 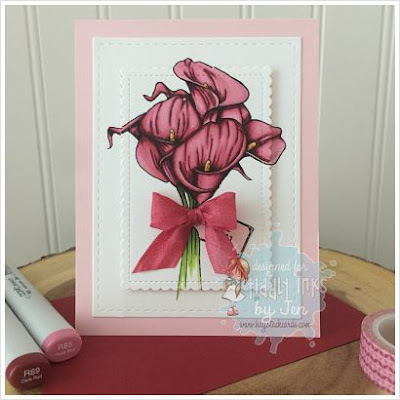 Calla lilies have always been one of my favorite flowers so when Christy released this image, I knew I had to create a card with it. I colored the image with Copics and then die cut that piece of cardstock with a mini stitched scallop rectangle frame. I popped up that panel with craft foam so that it would appear the image was overflowing along the edges. I colored white seam binding with coordinating Copics to match, tied it into a bow and added a little tag in pink cardstock that says, "For You". I love the clean and simple look of this design. You can find all of Christy's new images here. If you need more inspiration before you get crafty this weekend, feel free to check out the other projects created by the design team on the Tiddly Inks Challenge Blog. Thanks for stopping by!! Absolutely BEAUTIFUL! Thanks so much for joining us at The Sisterhood’s ‘PINK’ challenge and please come back again soon! Stunning card and beautifully colored!! Thank you for joining our challenge at The Sisterhood! Beautiful!! 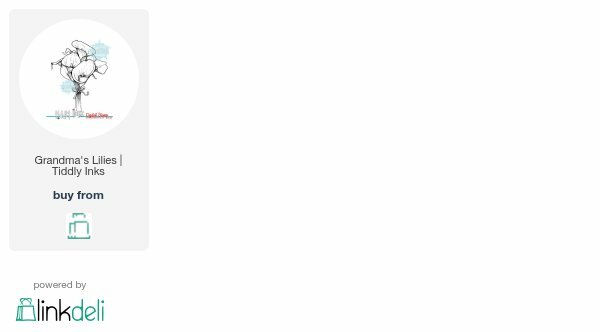 Love how it goes over the edge like that!